Location: South side of the junction of Dryden Street and Wakefield Road. Wakefield Road cuts through the west end of the station site. Present state: Demolished - the main station building was demolished in the 1970's to allow for the realignment of Wakefield Road. 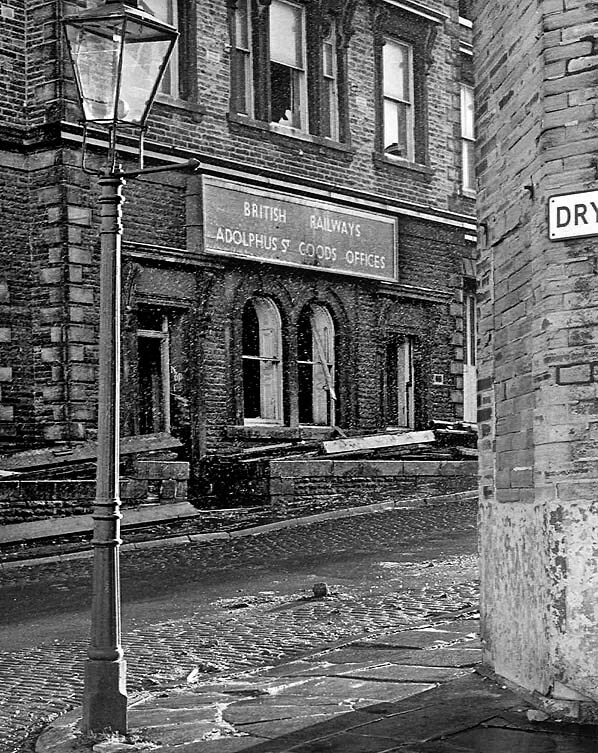 The access ramp to the goods yard on Dryden Street still exists, together with a substantial part of the side wall, including a bricked up entrance. Part of the coal depot (coal drops) on the south side of Dryden Street is extant. Notes: In the heady mid-Victorian days of railway fever, Bradford had no less than three terminus stations operated by three different companies; Kirkgate station (later Market Street, then Forster Square), operated by the Leeds & Bradford Railway (LBR), Exchange station, operated by the Lancashire & Yorkshire Railway (LYR) and Adolphus Street station, operated by the Leeds, Bradford & Halifax Junction Railway (LBHJR). The terminus at Adolphus Street was well laid out and spacious, but was inconveniently placed. It was further out of the city centre than the other termini, and passengers had to endure a steep uphill climb to reach the station. 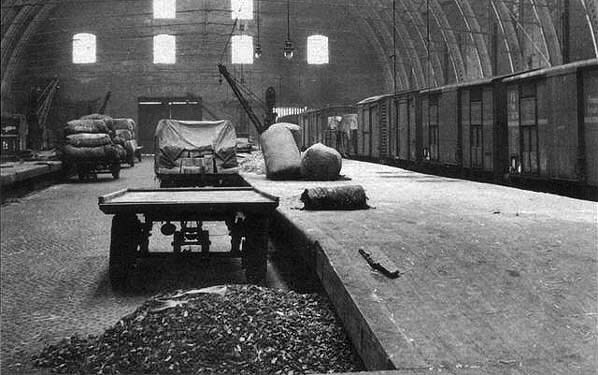 The station was provided with a substantial trainshed over six lines. There were four platform faces made up of two side platforms and a central island. Between each pair of platform lines there was a central road for running round. 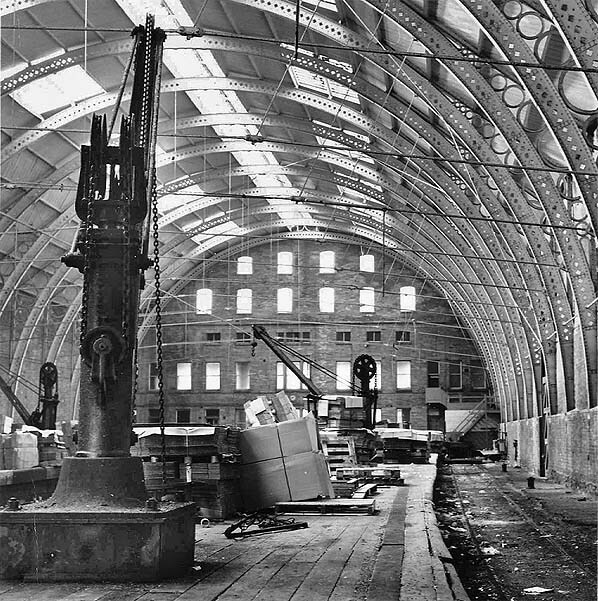 There was a concourse at the west end of the trainshed and at the back of the concourse a substantial range of office and passenger facilities including waiting rooms, a telegraph office and the booking office. There was a goods yard to the east of the station with numerous sidings two of which passed through a substantial goods shed. There was a large coal depot on the north side of the yard with an engine shed, turntable and coaling stage on the south side of the goods yard. Trains had to reverse out of the station and reverse again to continue their journey to Halifax via Bowling junction. In 1859, the LHBJR sought permission to obtain running powers into the more conveniently situated Exchange station via a planned three quarters of a mile link with the line from Halifax at Mill Lane junction. Permission was granted, and by the time this extension was opened in 1867, the LBHJR had been in the ownership of the Great Northern Railway for two years. Adolphus Street station was then closed for passengers, but remained in use for substantial goods traffic. The official closure date for the goods yard is 1 May 1972 but it is likely that all traffic ceased well before that date. 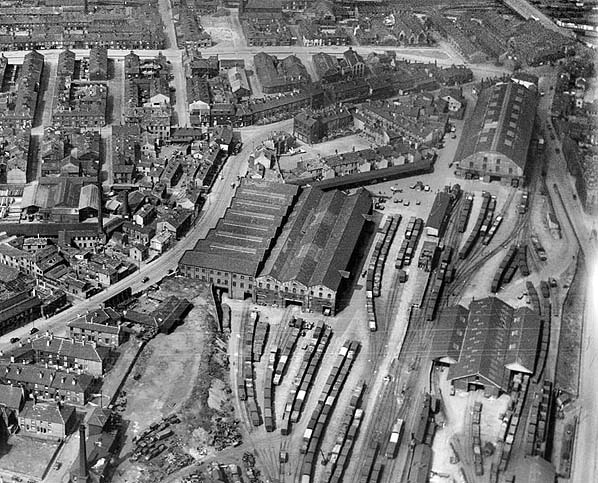 Although the trainshed was still standing, much of the goods yard had been demolished by 1970. 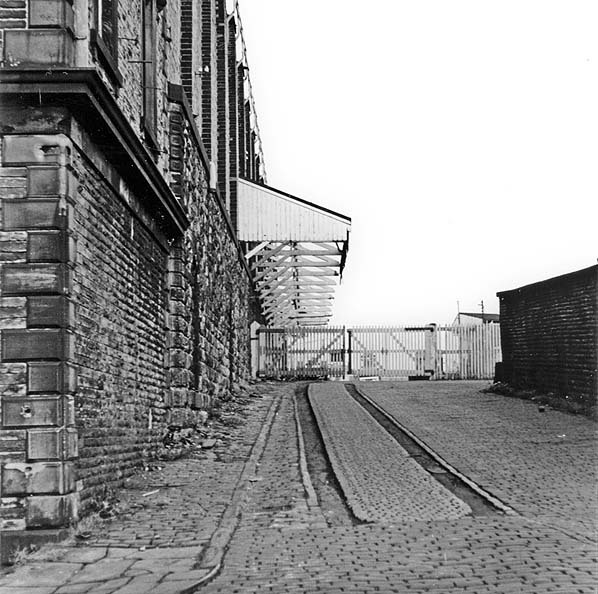 In 1972 the trainshed was demolished to facilitate the realignment of Wakefield Road. Adolphus Street itself (the road) was also lost during the road works. 1852 6" OS map showing Bradford Adolphus Street station and adjacent goods yard as built. This map doesn't shows Adolphus Street (parallel to Frederick Street), but it is shown on the map below which is based on the same 1847 survey. Adolphus Street station entrance in 1956; substantial offices and passenger facilities front onto the trainshed. The entrance to the booking office is in the centre of the building, from there two sets of steps led down to the station concourse. The original passenger platforms have not been retained. The platform on the left is probably original but the other side platform and the island have been replaced with a wider island platform. At this time only one line was still running into the trainshed. A major accident occurred on 10 November 1964 when 43072, an Ivatt 4F, was working a train of twenty-one empty wagons from Ardsley. The driver lost control at Laisterdyke and ran into Adolphus St. goods yard at an estimated speed of 50 mph. 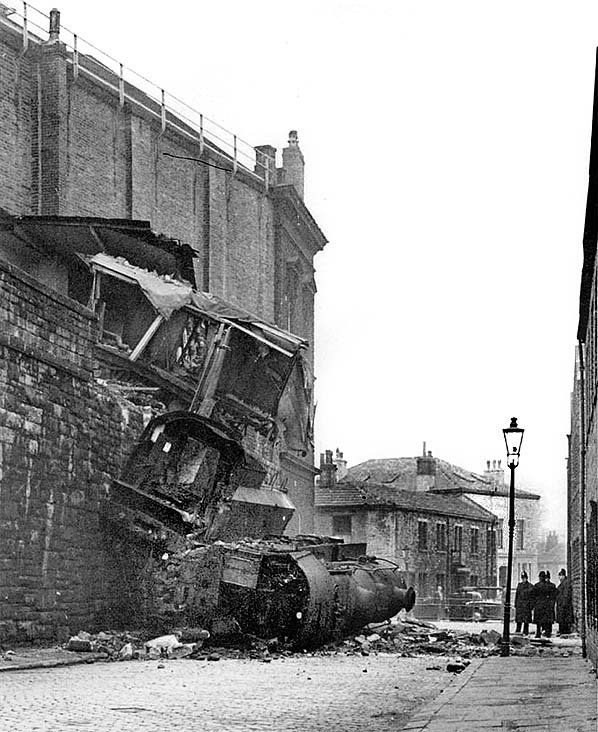 Before demolishing the buffers the crew jumped clear and the train crashed through a wall to fall 30ft into Dryden Street below. The 14 year old locomotive was considered beyond economic repair was cut up in the road 4 days later by G.W.Butler of Laisterdyke. 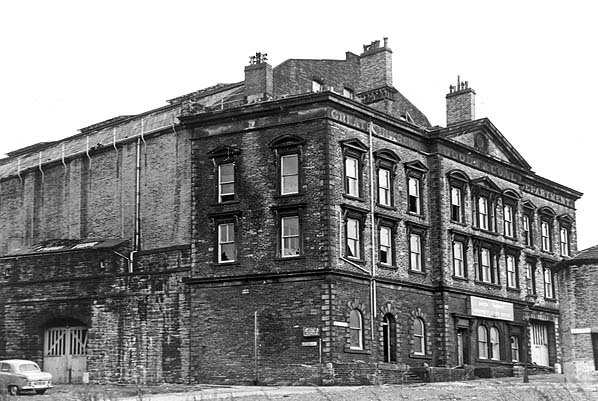 The Adolphus Street goods offices c1970. 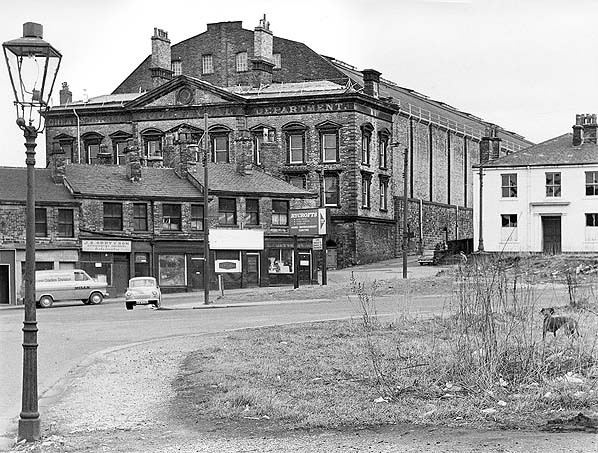 Adolphus Street station seen from Wakefield Road in May 1970. 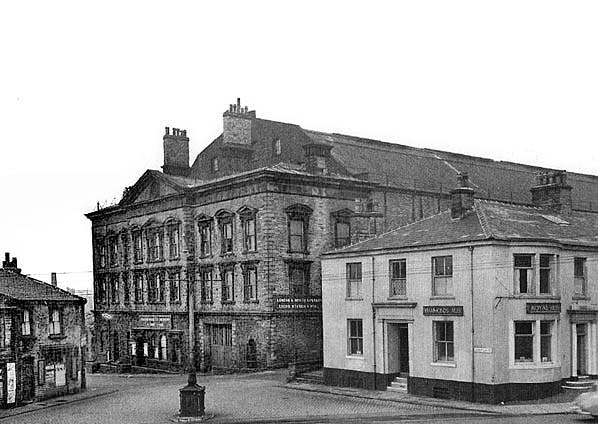 The words across the top of the building say 'Great Northern Goods & Coal Department'. Looking east along the south side of the Adolphus Street trainshed in October 1970. Adolphus Street entrance in October 1970.